The University of the Fraser Valley and the UFV Student Union Society are working together to realize a long-term dream of opening a Student Union Building on the Abbotsford campus. Construction began in mid-September 2013 on the building, which will be located west of the gymnasium complex and south of Building D.
The $15-million project will be financed on a cost-shared basis, with UFV students providing $10 million of the funding through a $35 per semester fee that was approved in a referendum in 2008. The university will provide $5 million of the funding. The architects for the project are Chernoff Thompson, and the building contractor is Mierau Contractors. Phase one of the building, to be completed by early 2015, will be 46,700 square feet and three storeys. It will house the Student Union Society, Student Life, Campus Card office, the Aboriginal Resource Centre, and a large multi-purpose hall on the first floor; the CIVL student radio station, the Cascade student newspaper, Aftermath, and more SUS services on the second floor; and the Career Centre, Alumni Engagement, Supported Learning Groups, and a variety of student meeting and study rooms on the third floor. Student leaders have been talking about wanting a Student Union Building on the Abbotsford campus for more than 20 years, and planning has been ongoing since the referendum passed in 2008. In addition to improving student space on campus, Toews is excited about the sustainability features of the new building, noting that students involved in the planning process were “incredibly passionate” about advancing the university’s sustainable design objectives to achieve the best in terms of livable spaces and energy efficiency. “There are a number of sustainable features that will significantly reduce energy costs and the building will be LEED Gold certified. It has also been designed with the option for an expansion which would add another third to the building,” he said. 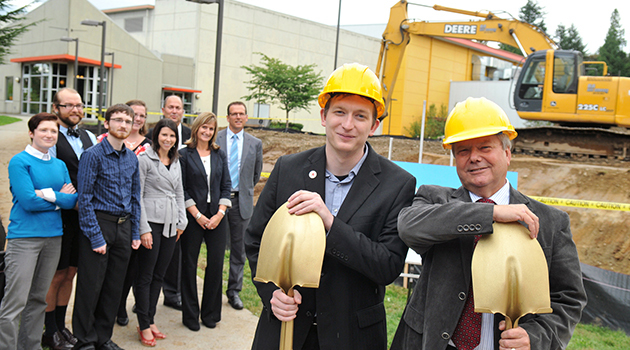 UFV Student Union Society president Shane Potter is also happy to see the project launched and shovels in the ground. Jody Gordon, UFV’s Vice President Student Services, said the new facility reflects the university’s commitment to providing additional space that supports student life, engagement, and development. Campus Cards have mighty powers — got yours?